wood fire | OG SoundFX - High Definition Sound FX & Ambient Loops. View cart “Earthquake 2 – Medium – Natural Disasters” has been added to your cart. 1 - 6 out of 6. You are browsing 1020406080 per page. Starts with a rumble and grows into a massive overwhelming noise of tremors and rocks slides until it finally stops, leaving only chaos behind. Perfect track to illustrate your earthquake scenes or other apocalyptic disasters, for your films, documentaries and video game. Browse our Album section for great deals: SFX Packs All tracks are High Quality 48Khz/24 bit WAV files. This is an intense track of a building in flames. You can hear the bursts of fire, the wood beam cracking and falling and causing a burst of fire sparks. Walls a re cracking and crumbling. You can loop this track as long as needed. Browse our Album section for great deals: SFX Packs All tracks are High Quality 48Khz/24 bit WAV files. A small yet relatively strong earthquake. Strong enough to make small trees fall and rocks rumble. 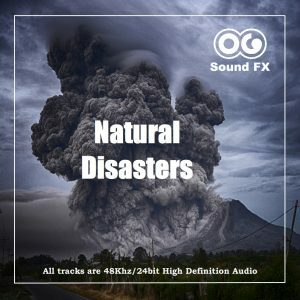 Perfect track to illustrate your earthquake scenes or other apocalyptic disasters, for your films, documentaries and video game. Browse our Album section for great deals: SFX Packs All tracks are High Quality 48Khz/24 bit WAV files. It seems that some kind of tremor triggered unstable rocks to fall from a cliff, or inside a cave. Maybe the origin is an earthquake or en explosion, but huge rocks start to fall and hit the ground in an overwhelming noise of stones and dust crushing. This mass of fallen rocks could take place at a bottom of a cliff, or inside a mine where hopefully, the exit isn't blocked by the rocks. Browse our Album section for great deals: SFX Packs All tracks are High Quality 48Khz/24 bit WAV files.